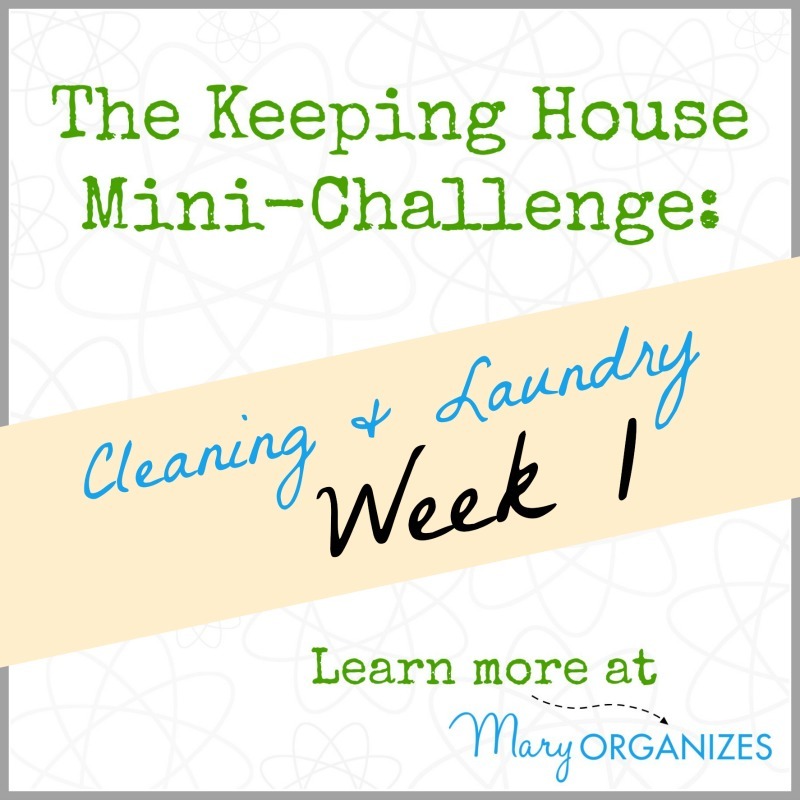 If you’re just joining us, read more about The Keeping House Mini-Challenge HERE before you get started. We need to catch up so we can keep up more easily. Week 1 may seem a little intense, but if you are willing to do the work this week, every week after this can be easier. Read the following tasks and plan out your week. Figure out now what you will sacrifice this week so that you can get this done. If you’re already too busy, you can’t add this on top of other things, you will need to prioritize. Deciding what you WILL NOT DO is just as important as deciding what you WILL DO. Commit now to finishing this week. You can do this. Now let’s get to it!! Put away all holiday decorations and holiday items. Deep Clean your kitchen, including the fridge. Do kitchen Laundry, including cleaning rags and linens. Read ***How to Deep Clean Your Kitchen***. Clean out your home office files and set up your system for this year. Read about How To Organize Your Home Office Files HERE. Gather all the piles of paper clutter together and then deal with them. Pay bills, respond, recycle, trash, or file as necessary. Stop putting it off and deal with it! Sometimes it really is best to rip the bandaid off fast. Don’t build up this task to be terrible and find reasons to put it off, just go for it. Do Bedding Laundry – just sheets and pillowcases. Do Towel Laundry from bathrooms and cleaning rags (separately). New post: ***How to Deep Clean Your Bathrooms***. Find homes for anything left out and put all items away. If something does not have a home, it does not belong in your home. Do a detailed tidy, not cleaning, throughout your home. Tidying is just getting things where they belong. Dust everywhere. This does not need to be an intense polishing. We will deal with that during Spring Cleaning. This is just a “get all of the dust up and out of your home” type of dusting. For areas that have not been dusted recently, even on the tops of shelves and furniture or low down right underneath the edges of furniture, I suggest using a vacuum attachment to dust. If the dust is normal, you can use a stick duster and swipe all the surfaces. Clean the floors. Vacuum carpets and mop tile/linoleum/etc. Fold and put away all laundry that is already clean and sitting in a pile somewhere. If a piece of clothing or other laundry item is not put away in a closet or drawer neatly, it needs to be picked up and cleaned and put away. At the end of today, your laundry room should be empty and dirty laundry should only be found in clothes hampers. Achieve this and you are ready to start a great laundry routine next week! Setup a laundry system for your children. Read The Easiest Way To Do Children’s Laundry HERE to learn how to set up kids’ laundry. Read ***Taming the Laundry Monster***. Plan for the week ahead! Read ***How to Plan Better***. No time to waste! Get to work!! Report back here with your progress so I can cheer you on!! Teaching kids to do anything takes time. It might take weeks of you guiding them through each step, reminding them through each step. After you feel like they have it on their own, attach rewards or natural consequences to the task. Good job! You are doing good helping your children learn important life skills! My daughter is 23 and appears allergic to clothes hangers or dresser drawers . Since 12 would take them off hangers and out of drawers and dress out of a basket only. Tried closet organizer shelving but used it for school supplies and books lol. Was grateful she choose not to use the floor. Feels good to be ahead!!! Imagine how you’ll feel this time next weekend! I SO desperately need this- Thanks Mary! Happy to help, Lydia! Have a great week! Can’t wait. It’ll be hard as I work nights and never get the sleep I need as everyone has a different schedule and I’m the only one who drives. Just do the best you can, as it seems you are already doing! Way to not make excuses and just get things done! This sounds like exactly what I need to keep me on track and to not get overwhelmed by everything that needs to be done as a whole. Thank you! I am in. So Week 2 will be able to be found here on facebook as well? Could you perhaps do an adaptation for those of us who work full time? I look at the Monday list and am already feeling defeated. There is no way Christmas will be put away, the kitchen deep cleaned, etc. after I get home from a full day of work and a high school soccer game at 9 pm. Then I look to Tuesday and see the whole thing unraveling before I even get started. HELP! Ok, I will do that. Thanks for the encouragement. Of course, you really can do this! You’re welcome! I bet your kitchen feels good now!!! I’m sorry to hear that you’re sick, I hope you’re already better. When you feel better, just pick yourself up and keep going! Thank you for posting this! It is so helpful. I’m so grateful for what you do! We have moved back to AR and I’d love to hire you when things get settled and you get back on your feet, literally. Take care. Oh, wow, thank you! It has been hard to pause my organizing business while I heal my foot. I can’t wait to get back to it. Hopefully I’ll be at it in no more than a few months from now! Mary, you are beyond words inspiring. Thank you for your sharing your extraordinary talents with such a practical, straightforward & realistic approach…you make these goals reachable! With a 3.5 year old & 7 mo old – laundry rules our lives…and makes for VERY late evenings nightly 🙁 cannot wait for “taming the laundry monster” – keep up the great advice, it’s working!!! I’m so glad this is helping!! That really makes it worth it to me! I should have read this earlier in the day. I did get some of this done, but not all for today. We don’t de-decorate until the weekend after Epiphany (1/6). Getting the kids to dust tomorrow. That will leave me to sort the piles of papers that built up over the last few weeks, ugh. Papers really multiply over the months of November and December. I’m glad you are working things around your schedule and goof for you to involve the kids! Got all of my laundry put away, and my kitchen deep cleaned, and deep cleaned my bathrooms today, because my home office, I have yet to be able to start due to the fact I can’t find it, my husband has been using it to store everything from the garage, so until I have help seeing has im 32 weeks prego moving the heavy stuff I can’t accomplished the task! But he is completely off tomorrow and has promised to move all storage to his new shed outside since we finished it this weekend, so I will accomplish my home office tomorrow! My husband is living this to do list! He has asked if you have a weekly printable one for not just the first week of the year? Something we can print and laminate so we have it to mark off when we finish a task, each day, and that way Sunday anytjinh that has not gotten accomplished we can accomplish together? Way to make good use of your time until you get the help you need! I actually have planners in my planner-store that have a weekly schedule in them. You can buy a copy for me to mail or a digital copy to download. The Home Management Planner System is the one that has tasks written in. I think that would help. That is so great that you are doing this together!! That will help so much! And getting these things taken care of before the baby is going to be such a relief when you want to focus on your baby in 8 weeks!! I’m going to have to stretch this out over possibly several weeks. Right before Christmas I started a second job and I don’t get home till 9 or later weeknights and a huge chunk of my weekends are working as well. I can ask the kids and hubby to do some of the easier things. On top of everything I’ve got a bad cold that’s kicking my hiney. Ok, done whining. I’ll do what I can when I go home for lunch and after I finally get home. You are a busy lady! Create your own deadline that works for you and commit! You can do this!